The basic components of an interdisciplinary burn rehabilitation program are wound care, range of motion, pressure garments, splinting and casting, conditioning and strengthening, psychological assessment and intervention, and long-term medical rehabilitation follow-up. The effectiveness of this approach to burn injury has been indirectly demonstrated by the significant reduction in reconstruction surgery admissions. The following is a synopsis of burn rehabilitation planning during both acute and post discharge phases of treatment. 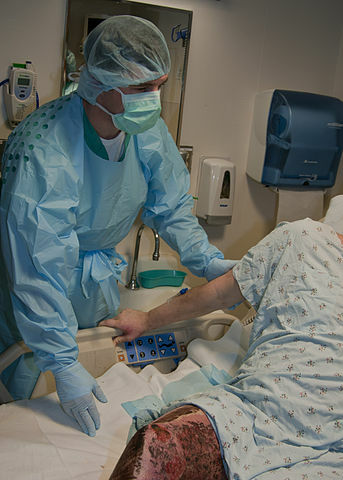 Inpatient burn rehabilitation begins on the day of admission or within the first 24 hours. The rehabilitation burn team normally consists of a physician, physical therapist, occupational therapist, social worker, and psychologist and/or psychiatrist. The patient is generally seen once or twice daily, 6 days per week, by both the physical and occupational therapist. Positioning with special devices in bed and chair. Casting and splinting of body parts to prevent contractures. Range of motion under anesthesia as indicated. Patients are then discharged to a burn rehabilitation facility, usually those with larger debilitating burns, or to an outpatient clinic for follow-up therapy. Problems that require outpatient treatment include open wounds, contractures, fragile hypersensitive skin, early hypertrophic scarring, itching, pain, weakness, deconditioning, and psychological/emotional reactions. Wound care and dressing changes. Paraffin and sustained stretch to all healed areas over joints with tightness. Active and active assistive exercises to all joints involved. Serial casting or splinting of major contractures. Massage to healed skin to desensitize and loosen scar tissue. Evaluative activities of daily living and modification with assistive devices as needed. Conditioning program consisting of treadmill, upper-body ergometer, and bike. Individualized strengthening programs for mononeuropathies. Silicon gel sheeting for hypertrophic scars. Prescription for prosthetic or orthotic devices where needed. This program could last anywhere from 4 to 6 months. It would decrease in number of days treated per week as the patient improves. It could last for a year or more if the burn injury is more severe. Rechecks by the physician prescribing treatment should occur every 2 weeks initially and every 1 to 2 months for the first 1 to 2 years. The psychological/emotional needs of individuals with burn injury also require attention. Problems identified during acute hospitalization should be properly addressed. These problems may take on greater significance after discharge, when the individual is faced with beginning the process of community reentry. Because burn injury results in documented psychological sequelae that can be disruptive to functional independence and compliance with treatment, it is recommended that individuals with burn injury be evaluated after discharge and at regular intervals to identify any problems. If they do exist, short-term psychotherapy is suggested. Relaxation training and biofeedback can be used adjunctively for sleep, pain, or other stress-related problems. Follow-up burn rehabilitation is required after reconstructive procedures such as contracture release. Wound care and range-of-motion exercises are usually restarted to assist with wound closure and prevent contracture recurrence. Specialized splinting or casting may be necessary to maintain proper positioning at night. In most cases this post reconstructive surgery rehabilitation period is much shorter (e.g., 5 to 6 weeks). Maintaining range of motion of a joint after healing or grafting is more difficult than in the acute phase. Burn scars contract, form bands, and thicken, and joint range of motion is affected. Remolding of the burn scar is possible while the scar is actively undergoing internal changes, such as collagen degradation and deposition and myofibroblastic activity. Once the burn scar matures, stretching a skin contracture is of less benefit. By far the most effective stretching technique for skin contractures is slow, sustained stretch. The part being stretched should be visible and should be palpated along the line of pull to ensure that the skin does not tear. Stretching can be done manually with weights, traction, splinting, and serial casting. The technique of applying paraffin to the part being mobilized and allowing 30 minutes of sustained stretch has been very rewarding in gaining range of motion. At the same time it decreases joint discomfort and lubricates the skin. The paraffin temperature must be lowered to 116° to 118°F to prevent burning of the skin. Another important principle in the exercise program is to put the entire length of a burn scar on a total stretch. In other words, if a scar crosses multiple joints, all involved joints are stretched simultaneously. A joint does not have full range of motion unless full range is obtained in combined movements. Finally, all patients should be on a generalized strengthening program for reconditioning after prolonged inactivity. Resistive exercises of opposing muscle groups also are beneficial in contracture prevention and treatment. Exercises for endurance and coordination frequently are overlooked in burn rehabilitation but are an essential aspect of the total program. A recent study has shown that patients with severe burns of more than 30% TBSA had weaker muscles years after the burn, suggesting either inability to fully recover or insufficient rehabilitation. The strength deficits were more marked at the faster velocities, suggesting a preferential atrophy of fast-twitch fibers. It was also shown that a cardiovascular fitness protocol with isokinetic strengthening was more effective than isometric and isotonic strengthening. Without the benefit of custom-made splints and casting, exercise programs would be in vain. A joint contracture may be stretched to full range, but maintaining that range depends in part on static and dynamic positioning accomplished with splinting and casting. Hence, the mistake often is made to splint joints in full extension for prolonged periods because the patient looks anatomically correct; however, function is sacrificed. This unfortunately is true especially for elbows, which often are placed in extension. Certain modalities commonly used in rehabilitation medicine clinics have been found useful in treating specific burn complications. Electrical stimulation, using an alternating current, is helpful in treating tendon adherence to underlying scar tissue. The transcutaneous electrical stimulator is useful for treatment of various pain problems, particularly those involving the shoulder from prolonged or faulty positioning. Ultrasound has been used to treat painful joints and facilitate better tolerance of range-of-motion exercise. It has also been applied along with ice massage to decrease hypertrophic scar pain. In a prospective randomized double-blind study, the effectiveness of ultrasound with passive stretching versus placebo ultrasound with passive stretching was investigated. The results indicated no difference in range of motion or perceived pain between these two groups. This suggests that although widely used, ultrasound may not have an effect on functional improvement of contractures. Intermittent compression units or similar devices are valuable in reducing edema in extremities, primarily the edematous hand. Posthealing hand edema secondary to circumferential burns of the forearm, hands with reflex sympathetic dystrophy, and hands with postischemic hand syndrome usually respond well to elevation and compression. Persistent edema can be devastating, because it can result in a frozen hand. Continuous passive motion (CPM) machines can never take the place of the hands-on exercises by the therapists. Occasionally, CPM is indicated with a patient who resists the exercise program from fear of pain, in children who seem to relax better with CPM, in those who need additional range-of-motion treatments for exceptionally tight areas, and in patients following excision of heterotopic ossification. An Easy Guide to Outpatient Burn Rehabilitation. Research Utilization Support & Help.